A simple sweet orange marmalade with thin slices of peel. I found making the Ginger Grapefruit Marmalade fairly easy, and we had some oranges, so I thought I'd make some regular marmalade too. 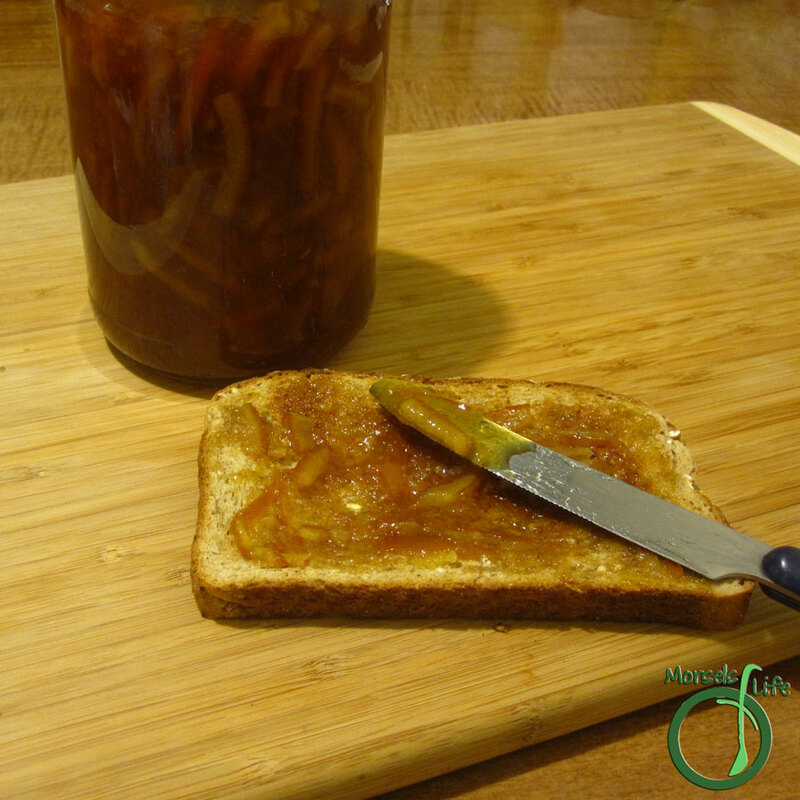 This marmalade is much simpler than the Ginger Grapefruit Marmalade - just 3 ingredients! You only need some oranges, sweetener, and water. You don't even need any pectin since there's enough in the oranges themselves! I made my peel slices about 1/4 inch thick, but comparing to some store-bought marmalade, I think 1/8 or even 1/16 inch thick slices would be better. Of course, you're free to make the peels any size you'd like. You could even make peel bits by cutting the peel into confetti pieces instead of strips - it's all up to you. How do you like your orange peels in marmalade - thick, thin, or confetti? Juice the oranges into a pot. Remove the remaining membranes and pulp, leaving behind the peel and pith. Place the membranes and seeds in a cheesecloth and tie it off. Slice peels into about 1/8 inch strips. Place all materials into a pot and simmer until peels get tender and mixture thickens, about 2 hours. Stir roughly every 15 minutes, squeezing juices from cheesecloth when you do. Orange Marmalade is my fav of all jams! Thanks for linking up at Show Me Your Plaid Monday's! Looks delicious! Thank you for sharing your recipe on Foodie Friends Friday Linky Party this week. Please come back on Sunday to vote for your favorite recipes! thank you for sharing on Tasty Thursday - congrats on being one of the most clicked!